Once i saw how the old DOpus looked like i became a fan. I love to see lotsa buttons, to see all the commands at my disposal. The bottom toolbarbuttons are individually configured, with 1-pixel high and 64 pixel wide transparent pngs, its a "hack" that Leo told me. WARNING 1: BACKUP YOUR OWN SETTINGS BEFORE IMPOTING MINE!!!! WARNING 2: This is a work in progress, and you get all of MY settings so when you import this backup, all of your own settings will be overwritten, also, there may be occasions when icons do not appear or some settings work differently than what you are used to, or some buttons dont work because i use different software installed into different paths so it is obvious it will not work for you. This is only to give you an idea how i managed to set things up, then implement these ideas into your own configuration! Nostalgic Directory Opus 4.12 theme? Wow! This brings back memories Love it. Hi，The Amiga-style Opus4 (dark-ish) is very beautiful,But importing this DOpus4.dlt does not achieve the effect. Can you export your Configuration, Which includes buttons and layouts. I edited the original post to contain my config backup! I used your backup file, but some icons do not inherit, in addition to the bottom of your screenshot of the button width is inconsistent, is it possible to upload a more complete file? Thank you very much! I can not give you a more complete file since mine isnt complete yet. The icons i use are temporary. Im still changing them from day to day. I think the best way to implement my backup file is to import it, take the toolbars out, import your own settings then copy the toolbars into it. Thank you very much, The shortcut button bar has been adjusted. After restoring your Dopus4_amiga_public.ocb, The some command icons are assigned to your Directory Opus\Icons folder, causing some buttons to display errors. Can you put your Directory Opus\Icons folder provided to us, thanks! Download this pack, and choose the icons for your liking. I only put up all of my configs, so other like me can get an idea that its possible, but you have to do the editing yourself. Currently i can not give you a full config package im sorry. If i settle with a "final" version i will upload everything i worked with, but again, this is mostly to give ideas to others, not to provide a config file which you can import and everything works. Its not possible yet. My Icons folder only contains the bottom toolbar icons, nothing else yet. But i really like this pack i linked, so if i feel like i should start putting icons in, i will choose them from this ASPneticons pack. I like pixellated stuff. Thank you very much, I like the retro UI (like win98) too. The bottom button is no longer a problem and it‘s perfect. Only individual icons inherit the windows system icons, it seems not so uniform, such as folder icons, disk icons, etc., still trying to solve. Thanks again! Where do I place the ocb and dlt-files for the theme and added buttons to appear? Config backups can be imported via Settings > Backup & Restore, but note that you will be importing everything about that person's configuration. Not just visual changes, but Preferences options about how files are copied, hotkeys, FTP site bookmarks, and so on will all be replaced. We don't recommend this. This is nice. Will this work on DOpus 11? It should. 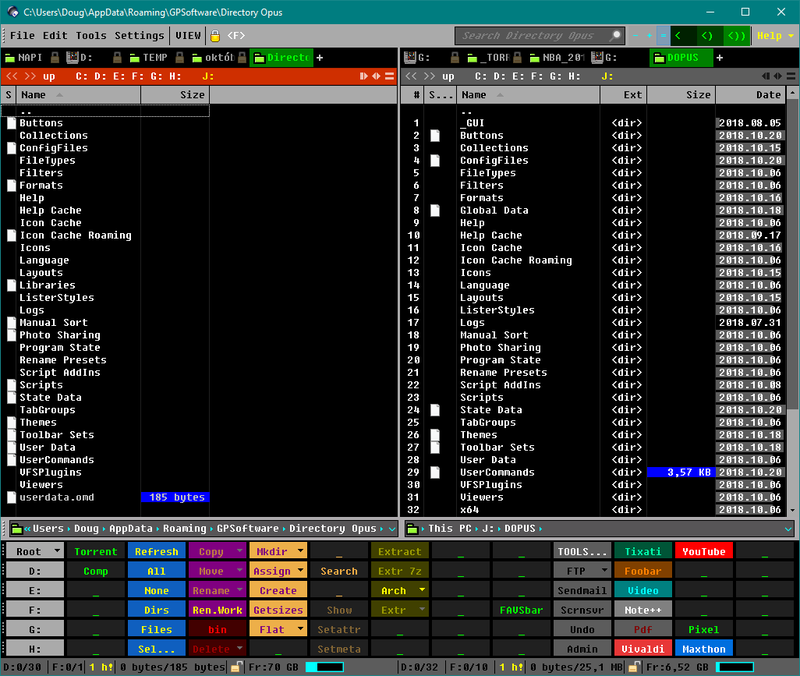 I cant remember exactly if DO11 has the new color changing options (for example the scroll bar etc.) but i made this with only the standard toolbar customization. But please read all the comments, since you cant just import my settings and expect it to look like the same. You have to do some solo work for it (like setting the transparent icons etc etc). So basically you will have to reconfigure a lot of the bottom toolbar buttons. This is just to give you an idea how i made it. Yes it is! This look/feel is much closer to an Amiga version of DO. I had been playing with mine trying to get the scrollable button banks and drive banks like I could do in my Amiga DO.